The Pamir Highway is an excellent challenge for a large four-wheel drive vehicle. The 1,200km road starts in Dushanbe, Tajikistan, crosses the Pamir Mountains, and ends in Osh, Kyrgyzstan. It is known as the “roof of the world”, as it reaches dizzy heights of 4,700 metres, and it is also known for its challenging road conditions, which range from OK to disaster. It’s the ultimate road trip. Martha was sounding a little unhappy because of the dodgy Uzbekistan fuel. Now that we had made it to Tajikistan, we filled her with decent quality petrol and some octane booster. It seemed to do the trick. Our first day on the Pamir Highway was smooth and simple. We drove from Dushanbe to Kulob, and eventually we reached the river Panj, which marks the border between Tajikistan and Afghanistan. We were in a valley, which was very beautiful, and we were just a stone’s throw away from Afghanistan. We could see Afghan villages, roads and people right up close. It was fascinating, but being so close to the border also presented a couple of issues. Two other Mongol Rally teams who had driven this route a few days before us had run into problems. 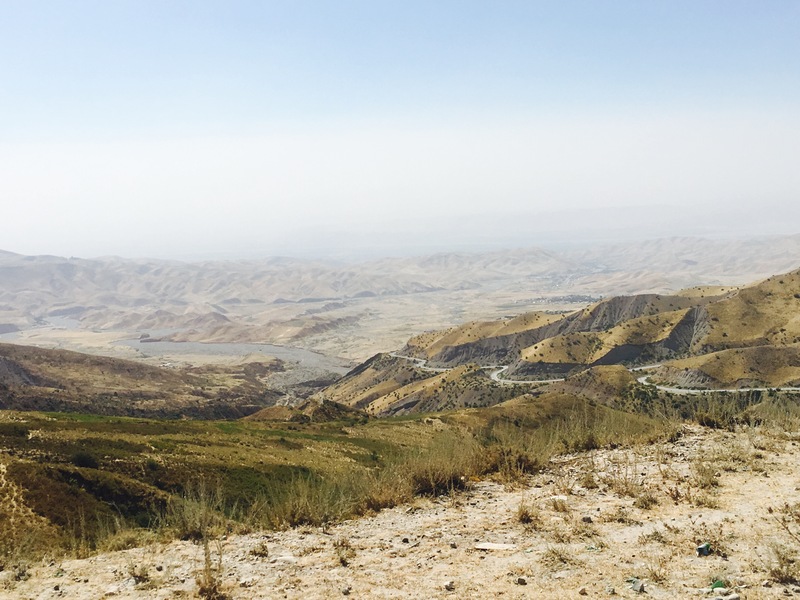 One team had tried to camp next to the border (the road goes so close that you can’t really camp anywhere else), and had been picked up by the Tajik army in the middle of the night and taken to sleep in one of their bases. Another team had accidentally taken a wrong turn and had ended up in a Taliban controlled area. Luckily they were OK, but they’d had to bribe some Tajik military officers to get them out (and not arrest them). Having spent time in military and police compounds in Pakistan several years ago, I had no wish to repeat the experience, so we tried to find somewhere to camp that would be safe and wouldn’t involve any late night army or Taliban adventures. As the sun was starting to set we arrived at a small village. 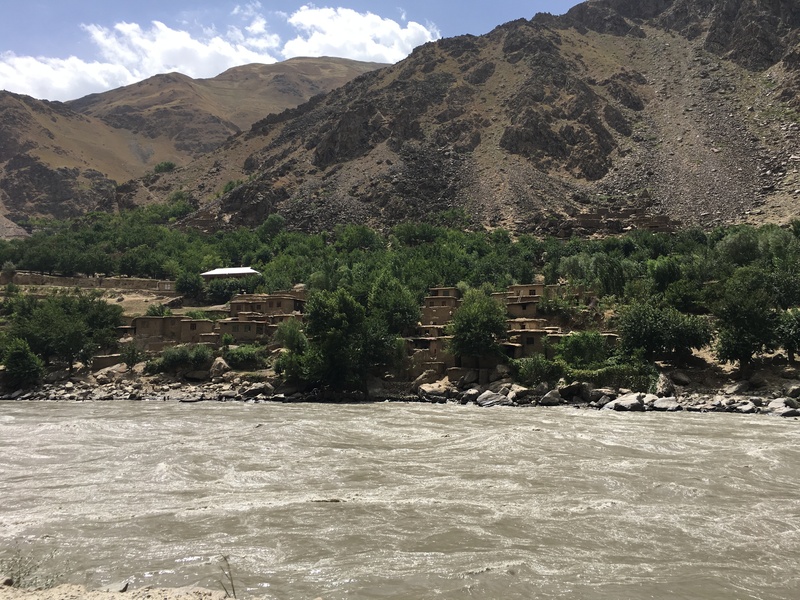 It was close to the Afghanistan border, but shielded by trees and, as people were happily living their everyday lives there, we thought it was probably safe. 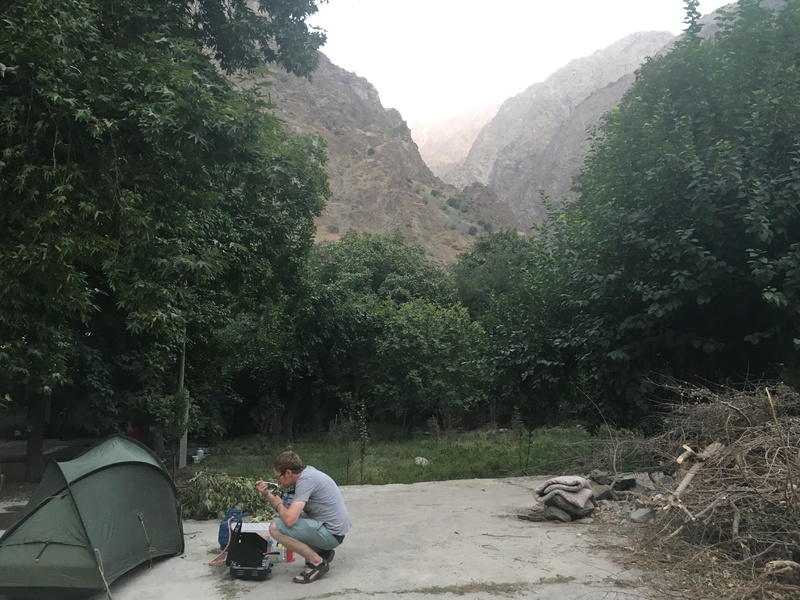 We asked whether it would be OK to put up our tent and camp in the village, and a young man who spoke English said it would be fine, and gave us a tour of the local area. (Here’s the river, here’s Afghanistan, here’s some tea and some fruit). We also had tea with an older man who seemed to own a lot of the land, and had made lots of money taking photos of the Tajik army. We looked at the pictures for a long time, and talked about religion and politics (I think he wanted to know what we made of Donald Trump). He also let Shane have a go with his catapult. Eventually we crawled into our tent for a sweaty night’s sleep. The next day we were hoping to get to the next big town – Khorog – around 300km away. We started early and made good progress. 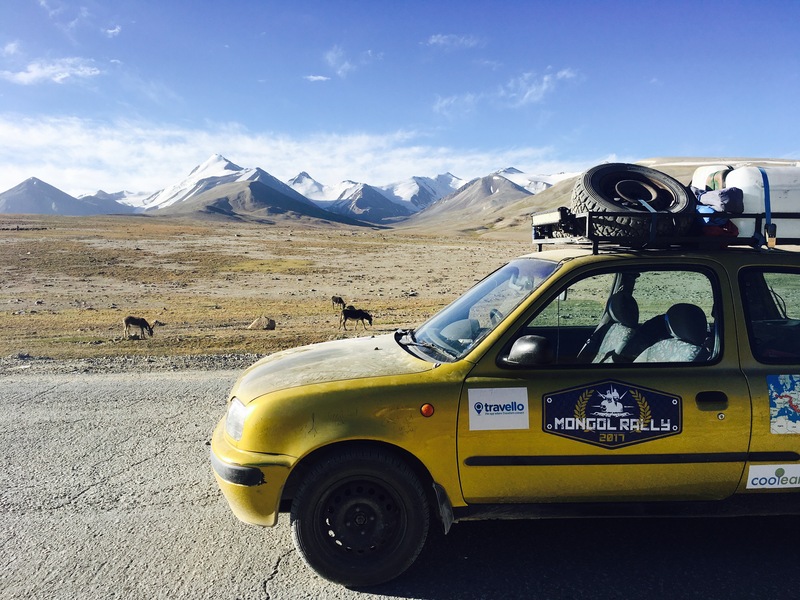 Before lunchtime we reached a smaller town and saw another Mongol Rally team had stopped. We stopped too to check they were OK, and they were not OK. 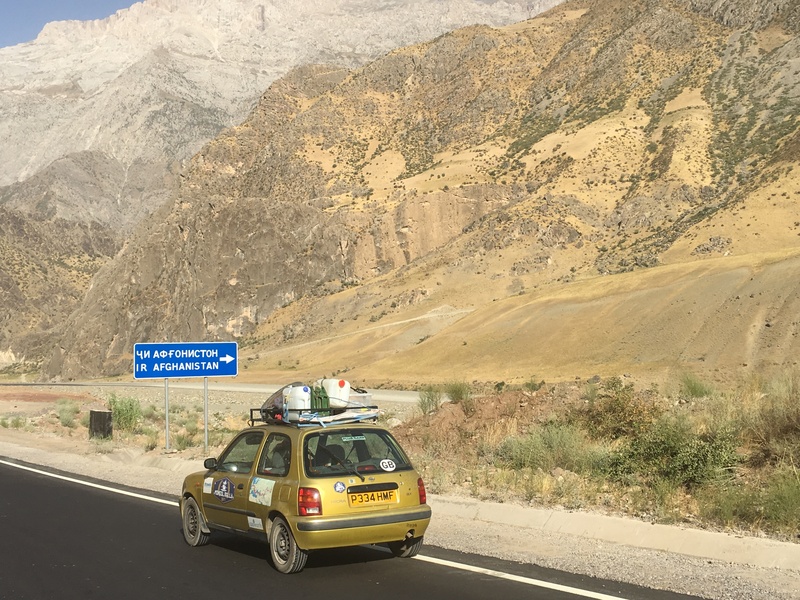 They had two cars – a Suzuki Jimney which looked like a serious expedition vehicle (not really in the spirit of the Mongol Rally but great for the Pamir Highway), and a VW Campervan. The VW Campervan had suffered some serious gearbox related damage and they were stuck. We gave them one of our ratchet straps to help them fix their gearbox issue, but there wasn’t much more we could do. Martha was too small to tow the campervan and they were a big team so we couldn’t fit them in the car. They were planning to go all the way back to Dushanbe. As the day continued, the roads started to deteriorate. We had to slow down. Our average speed dropped to about 10 km/hour, and stayed that way. At this rate it would take us about two weeks to finish the Pamir Highway, and we didn’t have two weeks. We started to worry that maybe Martha couldn’t cope with the bad roads after all. It was clear that we weren’t going to make it to Khorog that day. As it started to get dark, we realized we had driven only 180km, despite starting our day at 6am. We looked for somewhere to camp, but we still hadn’t left the Afghanistan border so needed to be careful. We stopped in a village and asked around. A nice lady let us park Martha in her driveway, and another nice lady let us camp in her garden close (but not too close) to her cows. All was well, until Shane woke me up in the middle of the night. He had realized that everything inside the tent was wet. Not just a little damp, but completely soaking. We got out of the tent and noticed that what we had thought was a good spot was actually in the middle of a sort of bog. The snow on the mountains around the valley had melted, so what had been a small stream was now a big marsh. The tent had flooded. We moved the tent to higher ground, but the swimming pool inside the tent didn’t disappear. It wasn’t the best night’s sleep we’ve ever had. We were quite happy to leave our swimming pool of a tent as early as possible the next day. We continued plodding along the terrible road as fast as we could (not very fast), and it wasn’t long before we encountered an interesting sight. There was a small pedestrian bridge linking Tajikistan to Afghanistan, and on the Tajik side of the bridge was a small penned area, with a significant number of police officers and military personnel. 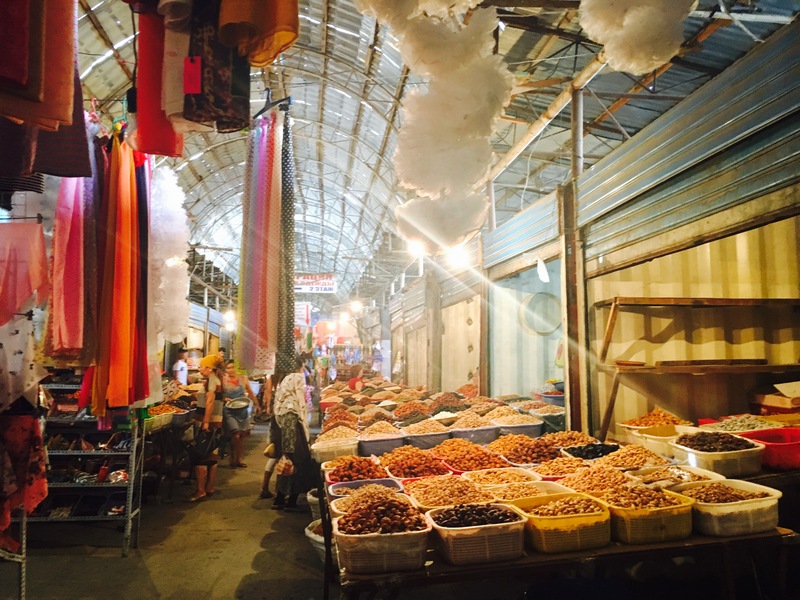 This turned out to be a weekly market where citizens from Afghanistan and Tajikistan were allowed to come together to trade without the stamping of passports or the purchasing of visas. We carried on our way, and by lunchtime we had reached Khorog. In the afternoon we finally left the Afghanistan border behind us and started to climb higher into the mountains. The road started to improve, the temperature dropped, and the landscape started to open up around us. It was so open that we struggled to find somewhere secluded enough to set up camp. We spotted two cyclists on the road and asked them what their plans were. They were going to Jelandy, about 8km away, where they said it was possible to get a hot shower. We thought we might as well follow them. It was true: there was a place in Jelandy where you could get a hot shower. But this was no hostel or hotel, and there were no other tourists staying there. This was Sarez Sanitarium. Nevertheless, it was comfortable enough. For $4 per person we were given two beds, free use of the sulphuric hot spring where we could (and did) bathe, free private parking and free use of the unattractive outside squat toilet. It was all a bit weird, but we had a bog-free night’s sleep. As we climbed higher and higher into the mountains, the road started to disappear again, but suddenly it didn’t matter any more. 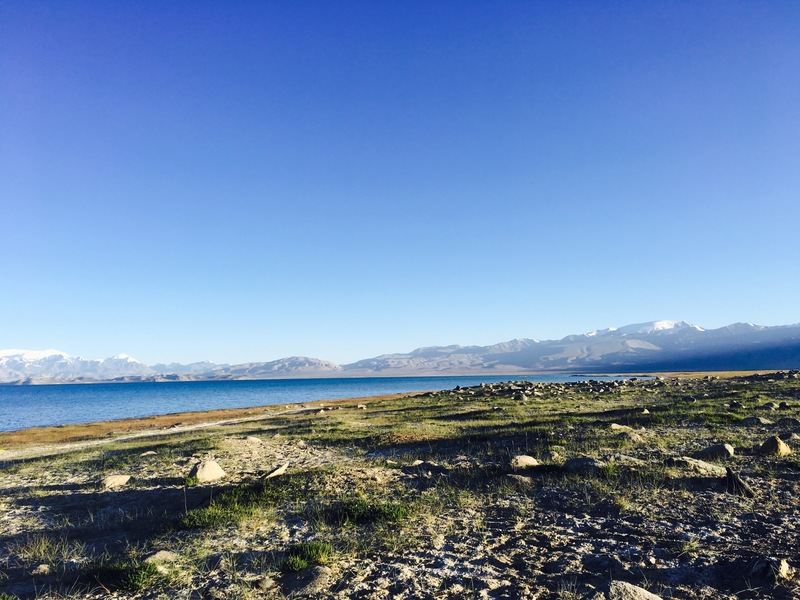 The views were spectacular – we saw snow capped mountains, a wide and open plateau, and our first yak! Martha drove further and further uphill, eventually making it all the way up the highest mountain pass – 4,700 metres above sea level. 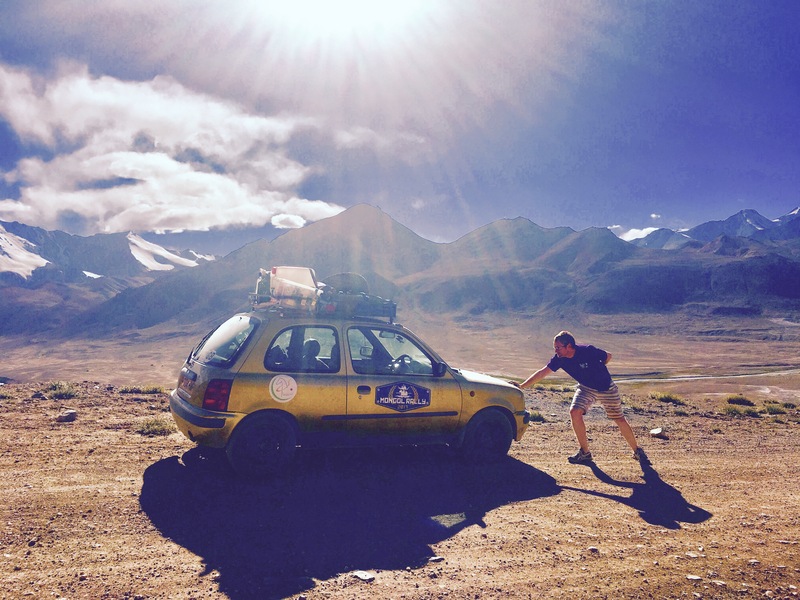 Martha reaches the high point of the Pamir Highway – 4,700 metres! 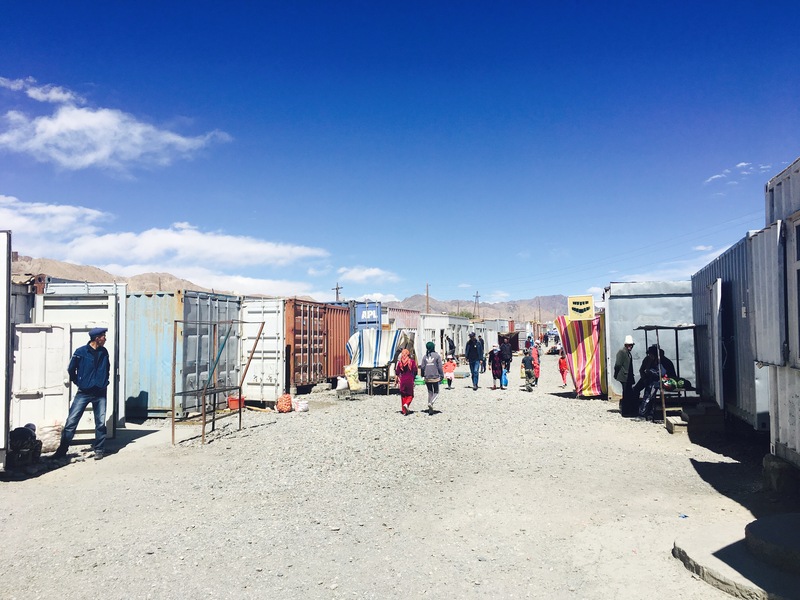 Around lunchtime we stopped in the next town – Murghab. It was incredibly isolated, and looked a little bleak. We still had a nice time visiting the town’s container market (a market where all the stalls have been made out of container ships), where Shane managed to buy an expensive banana (we have no idea how it can possibly have made it to Murghab), and had shashlyk and bread for lunch in a little shack café. If Murghab looked like a slightly depressing place to live in the summer, we could only imagine what it must be like in winter, when the temperature plumments to -40°C. In the afternoon we continued to drive through spectacular scenery, and eventually we reached Lake Karakol – a bright blue lake sitting beneath the mountains. We had been hoping to camp by the lake but found another bleak looking village there, so thought we had better ask about the best place to set up our tent. We were quickly directed to a couple who spoke some English, and they were happy to let us camp in their yard and use their facilities, and didn’t want any money at all. As we set up our tent, we noticed it was getting colder and colder. We used our camping stove to cook some spaghetti, but a combination of the lower boiling point of water at higher altitude and the general cold temperature and wind meant that the pasta was cold straight away. We quickly wrapped up warm and huddled into our tent. Our next stop was Osh – the end point of the Pamir Highway. On the way we had to cross the border from Tajikistan to Kyrgyzstan, which proved to be an interesting experience. Leaving Tajikistan was painful. Not only were the roads to the border falling apart (at one point Martha had to drive UP a waterfall), but it turned out to be our first experience with corrupt officials. To leave the country, we had to visit four different people for checks and stamps. Each man sat in his own little hut, so we had to navigate our way around the various buildings. The man in the first hut asked us for our “disinfection” certificate for the car. We had no such thing. Had we missed something? Apparently so… the man showed us various other disinfection certificates and kept demanding to see ours. Eventually he said he would let us off if we paid him 80 somoni (about $9). We argued about it for a while, and Shane asked him to give us a receipt (well, to sign his name on a bit of paper), which he eventually did, so we paid up. The second hut also proved interesting. This was customs. The man inside asked for our customs form, which we happily handed over. He then asked us for $10. “Why?” we kept asking. “What for?”. He couldn’t explain, and eventually he gave up and let us go. At this point we were convinced that something was amiss. These weren’t real charges – it was just the border officers trying to make some extra money out of us. The story in the third hut was familiar. We needed three pieces of paper for the car, and we didn’t have them. Apparently we were supposed to register in Murghab, pay some money, and get this paperwork. We explained that we had registered in Murghab (you can’t avoid registering just about everywhere as there are constant police stops where you are registered), but we hadn’t been given any paperwork. This man was more aggressive than the others, and he demanded 200 somoni (about $25) to “let us off” and allow us to exit Tajikistan. By this time, we were convinced we were being scammed, so we dug our heels in. Shane wrote out a hand written receipt with the car registration number, the money and the border crossing, but the guy just scribbled it out and got very defensive. He wasn’t going to let us leave, so Shane threatened to put up the tent and sleep outside until we were allowed through. The man didn’t like that. We went backwards and forwards with arguments, and eventually the man stormed off in a strop. Time was ticking on and we had a long journey ahead of us. We couldn’t get out without this man letting us through the gate, and it was clear he wasn’t budging on his terms. When he came back, it was with a new offer – for 88 somoni ($10) we could be free of Tajikistan. We argued a bit more, but eventually we gave in and handed over the money. In case you are wondering, we did some research later about whether we were in the wrong. Perhaps we should have had a disinfection certificate. Perhaps there was a $10 customs charge. Perhaps we should have obtained three pieces of paperwork in Murghab for the car. Well, no. It turns out none of these fees were based in any kind of reality. We had effectively been conned. Lesson learned for next time. Thankfully our experience entering Kyrgyzstan was much more pleasant. Apart from a short wait to clear customs (actually waiting for the electricity to come back on), everything went smoothly and the border officers were all friendly and honest. Kyrgyzstan itself was also very pleasant. 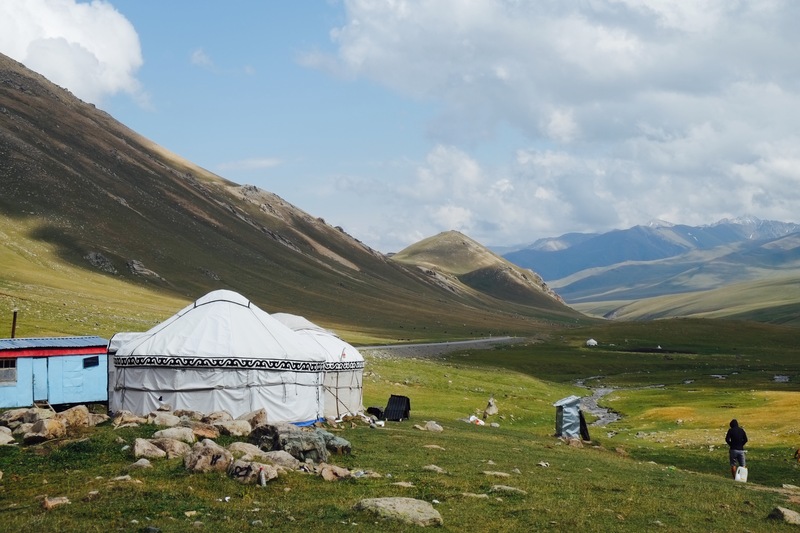 The roads were in better condition, the landscape was much greener, and we soon found ourselves in Osh, which marked the end of the Pamir Highway. 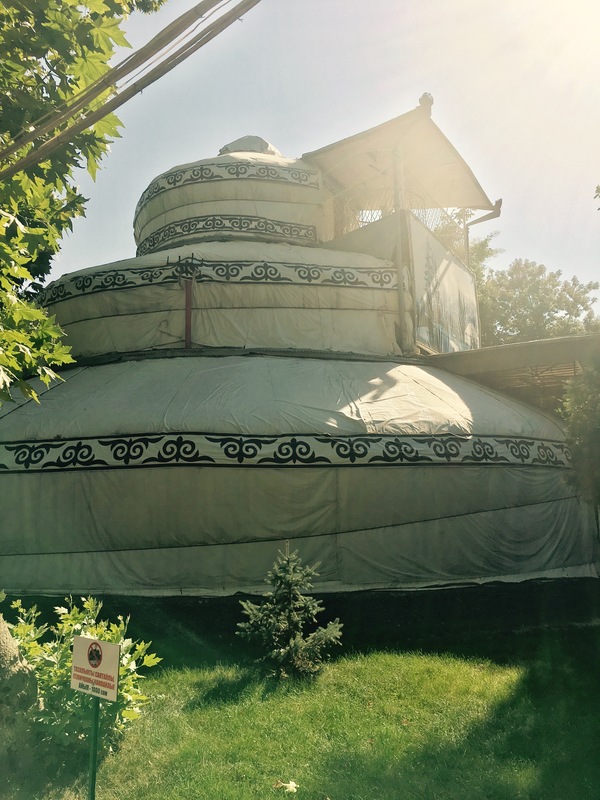 In Osh we had a lovely time exploring Central Asia’s largest bazaar and the world’s only three storey yurt. After five long days, some spectacular mountain views, some interesting sleeping experiences and some truly atrocious roads, we had made it to the end of the Pamir Highway. The scenery, the hospitality and the sense of adventure we experienced made this one of the highlights of the Mongol Rally so far. Martha drove on mountain roads, bad roads, sandy roads, no roads and even through rivers and waterfalls. She had made it to 4,700 metres above sea level, and is still in the same condition she was in when we left the U.K.
Mission accomplished. Who needs a massive four-wheel drive car when you have a gold Nissan Micra?! Great adventures. Love the scenery – and Martha. You must be so proud of Martha! Fantastic scenery, and memories to last a lifetime, I’m sure! Got to meet you Three when you come back to the UK – you are amazing and are so brave. Fantastic Georgia! And Shane and Martha. What an adventure. Looks awesome, I’m really envious. Remember stay safe & more importantly keep plenty in the tank!